Round headed arched door opening encasine stone doorcase with radial fanlight and timber raised and fielded panelled door. This is an eighteenth century two storey, seven bay, over basement stone house. It has a hipped roof with three chimney stacks and rectangular sash windows. A two columned divided window over the front entrance is larger. There are various extensions dating from different periods to the rear. The house is set back from the road, with a small shrubbery surrounded by railings.It appears that the house itself was built at three different stages with each addition clearly visible now that all the ivy has been removed from the front. According to Maurice Craig this is a typical house that was “built by or lived in, by minor gentry or prosperous farmers or manufacturers and traders” and distinguishes the architectural features of the “middle size house of this period as not being cottage-types writlarge” [being more obvious or prominent. 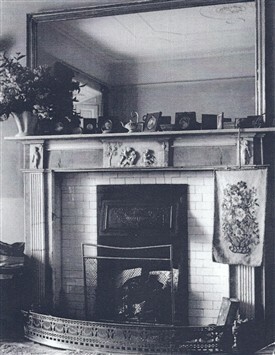 The small plaque, in the photo, on the wall above the door which has been removed was, according to Mr. Courtney Kenny, issued by the Fire Insurance Co., to indicate that the building had Fire Insurance. Stanhope Kenny owned 598 acres in Co. Mayo in 1876 and from 1880-1910 John Hearne of Ballinrobe was the Kenny agent. 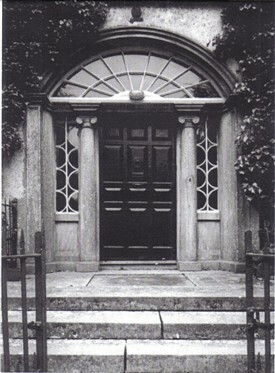 The magnificent limestone doorway at the centre of the front elevation is framed by two engaged columns with a semi circular fanlight. Two freestanding Ionic columns are on either side of the door with leaded glass panels also, on either side. display the beautiful interior of Robe Villa or Kenny’s House as it is known locally. According to Courtney Kenny, “the plaster work in the Hall, Drawing Room and Dining Room was created by the Francine Brothers. This project was done after they had completed work at Westport House”. One of the original ceilings in Robe Villa had cracked, following the large number of mourners who visited the laying out of a Kenny ancestor. The new ceilings, with their fine plasterwork required that the ceilings on the ground floor be raised to allow better proportions. This is obvious as the level of the window sills in some of the bedrooms became closer to the floor following the work. There were extensive gardens to the rear of Robe Villa and underground tunnels led to the Bower’s Walk, under the road to the front and side of the house. Information is available on some of the plantings in the Kenny Papers at Mayo County Library, Castlebar. Local knowledge describes an extensive garden to the rear of the house with a large orchard attached (currently Hawthorn Place). From the bridge on Bridge St., one can see a large cut stone industrial mill behind the house to the North West. It has multiple bays and is seven storeys high and built c 1800 on the site of an earlier mill. Milling was a large income source for the Kenny family and had been from the early 1700’s. Major deepening of the Robe as undertaken by the Kenny’s c 1847, to provide more power for the mill wheels. 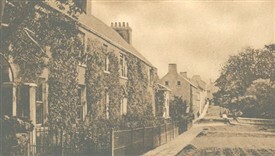 They also built a new bridge on Bridge Street around this time. The Kenny family commissioned, c 1818 four paintings, from James Arthur O’Connor ( 1792-1841) which hung in the house until sold to the National Gallery of Ireland in 1970. 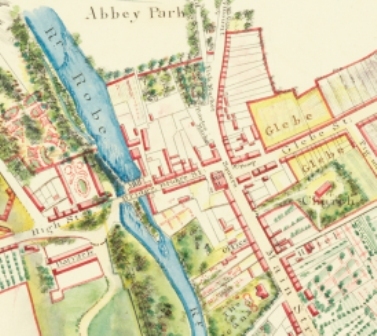 They were titled: The Mill, Robe Villa Lough Mask and finally The Pleasure Grounds. One painting titled Robe Villa shows the House and Mill with the Robe River in the foreground, another a panoramic view of the countryside at Lough Mask and The Pleasure Grounds displays the pleasure grounds to the front of the house. O’Connor spent a year and a half, in financial security, carrying out the commissions he received from patrons, including the Kennys, in the period 1818-1819. The last Kenny family member to own the property was Mr. Courtney Kenny, who currently resides in the UK with his wife and son, and is an internationally recognised Musician. Maeve Kenny, Courtney’s mom, was a grand-niece of Percy French, the noted songwriter. Courtney has one of the largest operatic repertoires in Ireland and Britain. He has been a Director of the Wexford Festival of Grand Opera and worked with them for 25 seasons over the past 30 years. Courtney studied at the Royal College of Music in London and began his career as an operatic coach and pianist. Amongst many achievements he joined the world renowned Glyndebourne Festival Opera in Sussex, and has since worked with many opera companies in the UK and elsewhere. He formed his own opera company and brought his Company to Ballinrobe on occasions in the 1960’s. He was also Head of the Music Staff with the New Sadler's Wells Opera (an operetta company) in London. He has toured Ireland on several occasions and has performed in the National Concert Hall, The Wexford Festival, The Belfast Festival and on The Late Late Show. After being vacant from some time the house was sold to the Ballinrobe Rugby Club circa 1992. They sold it some years later. Mayo County Council appears to have granted permission for apartments on the site. It is now back in private ownership. Personal interviews with Mr. Courtney Kenny. Feb 2010 – Jan 2011. Craig, M. Classic Irish Houses of the Middle Size, Ashfield Press, Dublin, 2006, p 3. Hutchinson, J., James Arthur O’Connor, The National Gallery of Ireland, Dublin 1985, p. 109.